Origin: Mojave desert endemic found in eastern California, southern Nevada, southwest Utah, and northwestern Arizona. Landscape Use: Very strong accent to focal point. A Mojave desert plant that is for desert landscapes. Form & Character: Arborescent (tree like), foreboding and untouchable, a dominant yucca. Growth Habit: Evergreen woody perennial, very slow when young. Eventually growing rather slowly to 15 to 30 feet high with a heavy trunk and a few heavy branches. Foliage/texture: Leaves of very young seedlings (less than 12 inches tall) are slender and tender - herbivory is a problem in native habitats....But, what a difference age makes! Adult foliage is densely arranged in rosettes at the apex of shoots, dagger-shaped, adult foliage is up to 1 foot long, greenish gray, stiff, sharp strap-like leaves, inflexible, persistent; medium texture. Flowers & fruits: Striking flower stalks, 3 feet in length, bearing white bell shaped flowers in clusters. Fruits are indehiscent capsules, 2 to 4 inches long, which become spongy and dry with age. Fruit clusters might weigh up to 10 pounds. Seasonal color: White flowers born on stalks in February to April. Temperature: Tolerant of cold. Surprisingly somewhat intolerant of highest summer heat (air temperatures higher than 110oF) of lower Sonoran and Mojave Desert valley floors. Soil: Well drained is a must requirement, rocky soil preferred. This large specimens yucca can be very difficult to grow under normal garden conditions. Watering: Rarely apply supplemental water. Disease and pests: Root rot is common in moist or poorly drained soils. 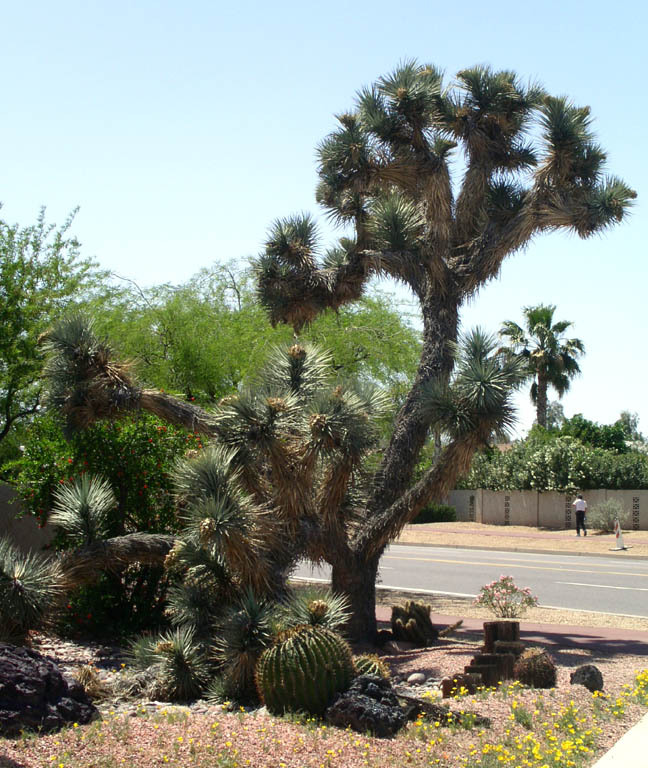 Additional comments: Joshua tree is the major life form of the high Mojave Desert. It is a difficult plant to work with because of short stiff leaves that taper to a "dagger like" point. With a Joshua tree and an old wagon wheel in your landscape you might expect to see Roy Rogers come riding up into your yard on his horse Trigger. Native Americans used the seeds as a nutritional food source, eaten raw or cooked. Also, native Americans used portions of the root system to make a red dye.